The following publications were published during our staff and affiliates’ tenure with the AgCenter. Please check individual pages of staff for other publications prior to their time with AgCenter. Publications are sorted by the first author’s last name. A three-year cohort study to assess the impact of an integrated food- and livelihood-based model on undernutrition in rural western Kenya 2010 Fanzo J., Remans R., Pronyk P.M., Negin J., Wariero J., Mutuo P., Masira J., Diru W., Lelerai E., Kim D., Nemser B., Muñiz M., Palm C., Sanchez P., Sachs S. Ehrlich, and Sachs J.D. 2010. A three-year cohort study to assess the impact of an integrated food Publications Reducing extreme poverty and hunger is the first Millennium Development Goal (MDG). With undernutrition contributing to one third of all child deaths, improving nutrition is a precondition for accelerating progress towards other MDG targets. While the role of technical interventions such as micronutrient fortification and supplementation in reducing morbidity and mortality has been well documented, evidence to support more comprehensive multi-sectoral approaches remains inconclusive. This chapter aims to evaluate the impact of an integrated food- and livelihood-based model on nutrition-related outcomes in rural western Kenya. A 3-year prospective cohort study was undertaken among 300 randomly selected wealth-stratified households. Detailed socio-economic and health surveys were conducted. A nutrition module assessed household levels of food security, food consumption frequency and diet diversity. This was complemented by anthropometric measurement and assessments of serum levels of vitamin A among children under 5 years old. The average food insecurity score decreased from 5.21 at baseline to 4.13 at follow-up (PPP=0.002) and from 62.3% to 38.3% (P=0.014), respectively. Vitamin A deficiency as measured by serum vitamin A levels decreased from 70.0% to 33.3% (P=0.007) for children under 5 years old. This study presents encouraging evidence that a multi-sectoral food- and livelihood-based model can improve diet quality, enhance food security and positively affect childhood nutritional outcomes. The wider application of this approach to a diversity of agro-ecological zones in sub-Saharan Africa is currently being assessed. Agroforestry with N2-fixing trees: Sustainable development’s friend or foe? 2014 Rosenstock T.S, Tully K.L., Arias-Navarro C., Neufeldt H., Butterbach-Bahl K., and Verchot L.V. 2014. Agroforestry with N2-fixing trees: Sustainable development’s friend or foe? Current Opinion in Environmental Sustainability 6. Publications Legume tree-based farming systems sit at a crucial nexus of agroecological sustainability. Their capacity to support microbial N2 fixation can increase soil nitrogen (N) availability and therefore improve soil fertility, crop yields, and support long-term stewardship of natural resources. However, increasing N availability oftentimes catalyzes the release of N into the surrounding environment, in particular nitrous oxide (N2O) — a potent greenhouse gas. We summarize current knowledge on the agroecological footprint of legume-based agroforestry and provide a first appraisal of whether the technology represents a pathway toward sustainable development or an environmental hazard. Assessing non-CO2 climate-forcing emissions and mitigation in sub-Saharan Africa 2014. Hickman JE, Scholes RJ, Rosenstock TS, Perez Garcia-Pando C, and Nyamangara J. Assessing non-CO2 climate-forcing emissions and mitigation in sub-Saharan Africa. Current Opinion in Environmental Sustainability 10: 65–72. Publications There are few direct measurements of anthropogenic climate-forcing emissions in Africa, making it difficult to accurately assess current emissions and to anticipate changes in future emissions. Emissions databases suggest that sub-Saharan Africa (SSA), home to less than 15% of the world's population, is responsible for 11% of anthropogenic methane (CH4) and 18% of anthropogenic nitrous oxide (N2O) emissions globally, though this includes substantial emissions from biomass burning that would occur in the absence of contemporary anthropogenic activity, and which may be over-estimated. SSA is also an important source of precursors to the greenhouse gas tropospheric ozone, and of mineral dust, which has a range of impacts on climate. Eliminating food insecurity and poverty is likely to take priority over greenhouse gas mitigation in the region, so innovations in mitigation must focus on ways to reduce emissions as an ancillary benefit of improving livelihoods. Assessing nutritional diversity of cropping systems in Africa 2011 Remans R., Flynn D.F.B., DeClerck F., Diru W., Fanzo J., Gaynor K., Lambrecht I., Mudiope J., Mutuo, P.K.K, Nkhoma P., Siriri D., Sullivan C., and Palm C.A. 2011. Assessing nutritional diversity of cropping systems in Africa. PLoS ONE 6(6). Publications Background In sub-Saharan Africa, 40% of children under five years in age are chronically undernourished. As new investments and attention galvanize action on African agriculture to reduce hunger, there is an urgent need for metrics that monitor agricultural progress beyond calories produced per capita and address nutritional diversity essential for human health. In this study we demonstrate how an ecological tool, functional diversity (FD), has potential to address this need and provide new insights on nutritional diversity of cropping systems in rural Africa. Methods and Findings Data on edible plant species diversity, food security and diet diversity were collected for 170 farms in three rural settings in Sub-Saharan Africa. Nutritional FD metrics were calculated based on farm species composition and species nutritional composition. Iron and vitamin A deficiency were determined from blood samples of 90 adult women. Nutritional FD metrics summarized the diversity of nutrients provided by the farm and showed variability between farms and villages. Regression of nutritional FD against species richness and expected FD enabled identification of key species that add nutrient diversity to the system and assessed the degree of redundancy for nutrient traits. Nutritional FD analysis demonstrated that depending on the original composition of species on farm or village, adding or removing individual species can have radically different outcomes for nutritional diversity. While correlations between nutritional FD, food and nutrition indicators were not significant at household level, associations between these variables were observed at village level. Conclusion This study provides novel metrics to address nutritional diversity in farming systems and examples of how these metrics can help guide agricultural interventions towards adequate nutrient diversity. New hypotheses on the link between agro-diversity, food security and human nutrition are generated and strategies for future research are suggested calling for integration of agriculture, ecology, nutrition, and socio-economics. Assessment of best management practices for nutrient cycling: A cast study on an organic farm in a Mediterranean-type climate 2012 Smukler, S., O'Geen A.T., and Jackson L.E. 2012. Assessment of best management practices for nutrient cycling: A cast study on an organic farm in a Mediterranean-type climate. Journal of Soil and Water Conservation 67(1), 16-31. Publications The effectiveness of best management practices (BMPs) designed primarily to protect surface water quality was assessed on a farm certified for organic tomato production to consider potential environmental quality and production tradeoffs. The BMPs included winter cover crops typically used in organic farming to cycle nutrients and reduce stormwater runoff; tailwater ponds designed to capture runoff; and tailwater return systems, which recycle runoff back to the field. The study took place at a 44 ha (108 ac) farm in Yolo County, California, over a two-year period. Monitoring throughout the winter rainy season showed cover crops successfully reduced runoff and loads of several constituents during the storm events, when compared to fallow. Total discharge was reduced by 44%, total suspended solids was reduced by 83%, ammonium was reduced by 33%, and dissolved organic carbon (DOC) was reduced by 58%. Estimates of leaching losses of DOC in the cover cropped fields, however, were 70% higher than the fallow fields in the winter rainy season and were 30% higher than the fallow fields in the summer irrigation season. During the summer irrigation season, the tailwater pond alone was highly effective in reducing losses of total suspended solids and volatile suspended solids to the neighboring riparian zone by 97% and 89%, respectively. The tailwater pond had no effect on dissolved reactive phosphorous and actually increased concentrations of nitrate-nitrogen (NO3?-N) in effluent by 40% and DOC by 20%. As was expected, the NO3?-N leaching measured by anion exchange resin bags and nitrous oxide emissions measured by static closed chambers was higher for the tailwater pond than the fallow field. Despite these differences, losses via NO3?-N leaching and nitrous oxide emissions accounted for only 24.7 and 0.48 kg N ha?1 y?1 (22.0 and 0.40 lb N ac?1), respectively, for the entire farm, even including ponds and ditches. When field and plot values were extrapolated to the entire tomato production area to understand the relative potential tradeoffs, results indicate that BMPs could be implemented without an impact on tomato marketable yields; the tailwater pond's higher nitrous oxide emissions would not significantly increase the overall emissions for tomato production given its relatively small size; and using tailwater ponds in combination with cover crops would decrease total suspended solids (TSS) losses compared to cover crops alone, with only minor increases in NO3?-N and DOC losses. Adding a tailwater return system to this combination of BMPs could help minimize these NO3?-N and DOC losses. Use of cover crops with a tailwater pond and tailwater return system are a combination of BMPS that can thus be recommended for organic production when considering multiple environmental outcomes. Assessment of nutrient deficiencies in maize in nutrient omission trials and long-term fields experiments in the West Africa Savanna 2009 Nziguheba G., Tossah B.K., Diels J., Franke A.C., Aihou K., Iwuafor E.N.O., and Merckx R. 2009. Assessment of nutrient deficiencies in maize in nutrient omission trials and long-term fields experiments in the West Africa Savanna. Plant and Soil 314:143-15 Publications Low soil fertility is one of the main constraints to crop production in the West African savanna. However, the response of major cereals to fertilizer applications is often far below the potential yields. Low fertilizer efficiency, inadequacy of current fertilizer recommendations, and the ignorance of nutrients other than N, P, and K may limit crop production. Nutrient limitations to maize production were identified in on-farm trials in Togo and in several long-term experiments in Nigeria and Benin. Maize ear leaf samples were analyzed for macro and micro-nutrients, and the Diagnosis and Recommendation Integrated Systems (DRIS) was applied to rank nutrients according to their degree of limitation to maize. In the on-farm trials, both yield and DRIS results indicated that, when N is supplied, P limited maize production in all fields, reducing yields by 31% on average. Sulfur was limiting in 81% of the fields and was responsible for an average yield reduction of 20%. In the long-term experiments where N, P, and K had been annually applied, Ca and Mg indices were strongly negative, indicative of deficiency. Zn indices were negative in all trials. Despite N-fertilizer additions, N indices remained negative in some of the long-term experiments, pointing to low efficiency of applied fertilizers. There was a direct link between DRIS indices and the management imposed in the different experiments, indicating that DRIS is a useful approach to reveal nutrient deficiencies or imbalances in maize in the region. Biogeochemical impacts of the northward expansion of kudzu under climate change: The importance of ecological context 2014 Hickman, J.E. and Lerdau, M.T. 2014. Biogeochemical impacts of the northward expansion of kudzu under climate change: The importance of ecological context. Ecosphere 4:10 Publications Climate change is generally expected to push plant species to higher latitudes and elevations; how the climate-induced migrations of disruptive invasive species may affect higher-latitude ecosystems has not been widely examined. Kudzu (Pueraria montana) has large impacts on nitrogen (N) cycling and trace N gas emissions in the southeastern United States. To understand how its projected northward migration under climate change will impact ecosystems in the northeastern United States, we examine the impacts of kudzu in the Mid-Atlantic region, near kudzu's northern invasion front. We pair plots invaded by kudzu with adjacent uninvaded plots, and examine rates of leaf litter decomposition, soil nitrogen pools and net cycling rates, N trace gas emissions, and microbial dynamics. Kudzu litter has more N and decomposes faster than litter from co-occurring species. Unlike in Georgia, near the center of kudzu's current range in the United States, kudzu invasion in the Mid-Atlantic has very small ecosystem impacts, causing significant increases only in the sizes of soil nitrate pools. These Mid-Atlantic ecosystems may be buffered against invasion impacts, creating a lag between changes in the plant community and biogeochemical changes. A combination of factors, including time since establishment, soil types, growing season length, and temperatures, may limit kudzu's biogeochemical impacts along its invasion front. Canopy and leaf composition drive patterns of nutrient release from pruning residues in a coffee agroforest 2012 Tully K. and Lawrence D. 2012. Canopy and leaf composition drive patterns of nutrient release from pruning residues in a coffee agroforest. Ecological Applications 22:1330-1344. Publications In a coffee agroforest, the crop is cultivated under the shade of fruit-bearing and nitrogen (N)-fixing trees. These trees are periodically pruned to promote flowering and fruiting as well as to make nutrients stored in tree biomass available to plants. We investigated the effect of canopy composition and substrate quality on decomposition rates and patterns of nutrient release from pruning residues in a coffee agroforest located in Costa Rica's Central Valley. Initial phosphorus (P) release was enhanced under a canopy composed solely of N-fixing, Erythrina poeppigiana compared to a mixed canopy of Erythrina and Musa acuminata (banana). Both initial and final N release were similar under the two canopy types. However, after five months of decomposition, a higher proportion of initial N had been released under the single canopy. Although patterns of decomposition and nutrient release were not predicted by initial substrate quality, mass loss in leaf mixtures rates were well predicted by mean mass loss of their component species. This study identifies specific pruning regimes that may regulate N and P release during crucial growth periods, and it suggests that strategic pruning can enhance nutrient availability. For example, during the onset of rapid fruit growth, a two-species mixture may release more P than a three-species mixture. However, by the time of the harvest, the two- and three-species mixtures have released roughly the same amount of N and P. These nutrients do not always follow the same pattern, as N release can be maximized in single-species substrates, while P release is often facilitated in species mixtures. Our study indicates the importance of management practices in mediating patterns of nutrient release. Future research should investigate how canopy composition and farm management can also mediate on-farm nutrient losses. Cash, food or vouchers in urban and rural Kenya? An application of the market information and food insecurity response analysis framework 2012 Michelson H., Lentz E.C., Mulwa R., Morey M., Cramer L., McGlinchy M., and Barrett C.B. 2012. Cash, Food or vouchers in urban and rural Kenya? An application of the market information and food insecurity response analysis framework. Food Security. Publications This paper uses the Market Information and Food Insecurity Response Analysis Framework to analyze data on food market intermediation and on consumer behavior and preferences in order to clarify whether market-based cash and voucher programs are likely to prove effective for addressing food insecurity in rural and urban study sites in Kenya. The findings carry important implications for food security interventions by government and operational agencies. We confirm that context matters when undertaking a response analysis. While we find that cash and/or vouchers are appropriate in both urban and rural locations, markets in surveyed urban settlements can respond better to a large injection of cash or vouchers than can surveyed rural areas. Moreover, household vulnerabilities are associated with household preferences in different ways across the two sites. In rural areas, female headed households and households reporting a physical limit to market access were among the groups that strongly preferred food aid to cash or vouchers while households with these characteristics in urban areas preferred the flexibility of cash or vouchers to food. Climate fails to explain wood decomposition at regional scales 2014. Bradford MA, RJ Warren, P Baldrian, T Crowther, DS Maynard, EE Oldfield, W Weider, SA Wood, and JR King Publications Decomposition of organic matter strongly influences ecosystem carbon storage. In Earth-system models, climate is a predominant control on the decomposition rates of organic matter. This assumption is based on the mean response of decomposition to climate, yet there is a growing appreciation in other areas of global change science that projections based on mean responses can be irrelevant and misleading. We test whether climate controls on the decomposition rate of dead wood—a carbon stock estimated to represent 73 ± 6 Pg carbon globally—are sensitive to the spatial scale from which they are inferred. We show that the common assumption that climate is a predominant control on decomposition is supported only when local-scale variation is aggregated into mean values. Disaggregated data instead reveal that local-scale factors explain 73% of the variation in wood decomposition, and climate only 28%. Further, the temperature sensitivity of decomposition estimated from local versus mean analyses is 1.3-times greater. Fundamental issues with mean correlations were highlighted decades ago, yet mean climate–decomposition relationships are used to generate simulations that inform management and adaptation under environmental change. Our results suggest that to predict accurately how decomposition will respond to climate change, models must account for local-scale factors that control regional dynamics. Conservation agriculture and ecosystem services: An overview 2014 Palm, C.A., Blanco-Canqui, H., DeClerck, F., Gatere, L., & Grace, P. Publications Conservation agriculture (CA) changes soil properties and processes compared to conventional agriculture. These changes can, in turn, affect the delivery of ecosystem services, including climate regulation through carbon sequestration and greenhouse gas emissions, and regulation and provision of water through soil physical, chemical and biological properties. Conservation agriculture can also affect the underlying biodiversity that supports many ecosystem services. In this overview, we summarize the current status of the science, the gaps in understanding, and highlight some research priorities for ecosystem services in conservational agriculture. The review is based on global literature but also addresses the potential and limitations of conservation agriculture for low productivity, smallholder farming systems, particularly in Sub Saharan Africa and South Asia. There is clear evidence that topsoil organic matter increases with conservation agriculture and with it other soil properties and processes that reduce erosion and runoff and increase water quality. The impacts on other ecosystem services are less clear. Only about half the 100+ studies comparing soil carbon sequestration with no-till and conventional tillage indicated increased sequestration with no till; this is despite continued claims that conservation agriculture sequesters soil carbon. The same can be said for other ecosystem services. Some studies report higher greenhouse gas emissions (nitrous oxide and methane) with conservation agriculture compared to conventional, while others find lower emissions. Soil moisture retention can be higher with conservation agriculture, resulting in higher and more stable yields during dry seasons but the amounts of residues and soil organic matter levels required to attain higher soil moisture content is not known. Biodiversity is higher in CA compared to conventional practices. In general, this higher diversity can be related to increased ecosystem services such as pest control or pollination but strong evidence of cause and effect or good estimates of magnitude of impact are few and these effects are not consistent. The delivery of ecosystem services with conservation agriculture will vary with the climate, soils and crop rotations but there is insufficient information to support a predictive understanding of where conservation agriculture results in better delivery of ecosystem services compared to conventional practices. Establishing a set of strategically located experimental sites that compare CA with conventional agriculture on a range of soil-climate types would facilitate establishing a predictive understanding of the relative controls of different factors (soil, climate, and management) on ES outcomes, and ultimately in assessing the feasibility of CA or CA practices in different sites and socioeconomic situations. The feasibility of conservation agriculture for recuperating degraded soils and increasing crop yields on low productivity, smallholder farming systems in the tropics and subtropics is discussed. It is clear that the biggest obstacle to improving soils and other ES through conservation agriculture in these situations is the lack of residues produced and the competition for alternate, higher value use of residues. This limitation, as well as others, point to a phased approach to promoting conservation agriculture in these regions and careful consideration of the feasibility of conservation agriculture based on evidence in different agroecological and socioeconomic conditions. Contingency in ecosystem but not plant community response to multiple global change factors 2012-10 Bradford M.A., Wood S.A., Maestre F.T., Reynolds J.F., and Warren R.J. 2012. Contingency in ecosystem but not plant community response to multiple global change factors. New Phytologist 196: 2. Publications Community and ecosystem responses to global environmental change are contingent on the magnitude of change and interacting global change factors. To reveal whether responses are also contingent on the magnitude of each interacting factor, multifactor, multilevel experiments are required, but are rarely conducted. We exposed model grassland ecosystems to six levels of atmospheric CO2 and six levels of nitrogen enrichment, applying the latter both chronically (simulating deposition) and acutely (simulating fertilization). The 66 treatments were maintained for 6 months under controlled growing conditions, with biomass harvested every 28 d and sorted to species.  Aboveground plant productivity responses to CO2 were contingent on nitrogen amount, and the responses to nitrogen amount were dependent on whether applications were chronic or acute. Specifically, productivity responses to increasing CO2 concentrations were accentuated with higher nitrogen enrichments, and productivity was greater when higher nitrogen enrichments were applied acutely. Plant community composition was influenced only by nitrogen enrichment, where the co-dominant grass species with the greatest leaf trait plasticity increasingly dominated with higher nitrogen amounts.  Community processes are considered to be unpredictable, but our data suggest that the prediction of the impacts of simultaneous global changes is more complex for ecosystem processes, given that their responses are contingent on the levels of interacting factors. Current and future nitrous oxide emissions from African agriculture 2011 Hickman J.E., Havlikova M., Kroeze C., and Palm C. 2011. Current and future nitrous oxide emissions from African agriculture. Current Opinions in Environmental Sustainability 3:370-378. Publications Most emission estimates of the greenhouse gas nitrous oxide (N2O) from African agriculture at a continental scale are based on emission factors, such as those developed by the IPCC Guidelines. Here we present estimates from Africa from the EDGAR database, which is derived from the IPCC emission factors. Resulting estimates indicate that N2O emissions from agriculture represented 42% of total emissions from Africa (though that rises to 71% if all savannah and grassland burning is included), or roughly 6% of global anthropogenic N2O emissions (or 11% including burning). Emissions from African agriculture are dominated by grazing livestock; 74% of agricultural N2O excluding biomass burning was from paddocks, ranges, and pasture. Direct soil emissions represent 15% of agricultural emissions; substantial changes in direct emissions from North Africa helped drive a 47% continental increase in direct soil emissions from 1970 to 2005. Future trends based on the Millennium Ecosystem Assessment scenarios indicate that agricultural N2O emissions may double in Africa by 2050 from 2000 levels. Any regional or continental estimates for Africa are, however, necessarily limited by a paucity of direct measurements of emissions in sub-Saharan agro-ecosystems, and the heavy reliance on emission factors and other default assumptions about nitrogen cycling in African agriculture. In particular, a better understanding of livestock-related N inputs and N2O emissions will help improve regional and continental estimates. As fertilizer use increases in sub-Saharan Africa, emission estimates should consider several unusual elements of African agriculture: farmer practices that differ fundamentally from that of large scale farms, the long history of N depletion from agricultural soils, seasonal emission pulses, and emission factors that vary with the amount of N added. Decoupling of deforestation and soy production in the southern Amazon during the late 2000s 2012 Macedo M.N., DeFries R., Morton D.C., Stickler C.M., Galford G.L., and Shimabukuro Y.E. 2012. Decoupling of deforestation and soy production in the southern Amazon during the late 2000s. PNAS 109 (4). Publications From 2006 to 2010, deforestation in the Amazon frontier state of Mato Grosso decreased to 30% of its historical average (1996–2005) whereas agricultural production reached an all-time high. This study combines satellite data with government deforestation and production statistics to assess land-use transitions and potential market and policy drivers associated with these trends. In the forested region of the state, increased soy production from 2001 to 2005 was entirely due to cropland expansion into previously cleared pasture areas (74%) or forests (26%). From 2006 to 2010, 78% of production increases were due to expansion (22% to yield increases), with 91% on previously cleared land. Cropland expansion fell from 10 to 2% of deforestation between the two periods, with pasture expansion accounting for most remaining deforestation. Declining deforestation coincided with a collapse of commodity markets and implementation of policy measures to reduce deforestation. Soybean profitability has since increased to pre-2006 levels whereas deforestation continued to decline, suggesting that antideforestation measures may have influenced the agricultural sector. We found little evidence of direct leakage of soy expansion into cerrado in Mato Grosso during the late 2000s, although indirect land-use changes and leakage to more distant regions are possible. This study provides evidence that reduced deforestation and increased agricultural production can occur simultaneously in tropical forest frontiers, provided that land is available and policies promote the efficient use of already-cleared lands (intensification) while restricting deforestation. It remains uncertain whether government- and industry-led policies can contain deforestation if future market conditions favor another boom in agricultural expansion. Ecological approaches to human nutrition 2011 DeClerck F., Fanzo J., Palm C., and Remans R. 2011. Ecological approaches to human nutrition. Food and Nutrition Bulletin 32: S41-S50. Publications BACKGROUND: Malnutrition affects a large number of people throughout the developing world. Approaches to reducing malnutrition rarely focus on ecology and agriculture to simultaneously improve human nutrition and environmental sustainability. However, evidence suggests that interdisciplinary approaches that combine the knowledge bases of these disciplines can serve as a central strategy in alleviating hidden hunger for the world's poorest. OBJECTIVE: To describe the role that ecological knowledge plays in alleviating hidden hunger, considering human nutrition as an overlooked ecosystem service. METHODS: We review existing literature and propose a framework that expands on earlier work on econutrition. We provide novel evidence from case studies conducted by the authors in western Kenya and propose a framework for interdisciplinary collaboration to alleviate hidden hunger, increase agricultural productivity, and improve environmental sustainability. RESULTS: Our review supports the concept that an integrated approach will impact human nutrition. We provide evidence that increased functional agrobiodiversity can alleviate anemia, and interventions that contribute to environmental sustainability can have both direct and indirect effects on human health and nutritional well-being. CONCLUSIONS: Integrated and interdisciplinary approaches are critical to reaching development goals. Ecologists must begin to consider not only how their field can contribute to biodiversity conservation, but also, the relationship between biodiversity and provisioning of nontraditional ecosystem services such as human health. Likewise, nutritionists and agronomists must recognize that many of the solutions to increasing human wellbeing and health can best be achieved by focusing on a healthy environment and the conservation of ecosystem services. Elevated methane concentrations in trees of an upland forest 2012-08-01 Covey K.R., Wood S.A., Warren R.J., Lee X., and Bradford M. 2012. Elevated methane concentrations in trees of an upland forest, Geophysical Research Letters 39. Publications There is intense debate about whether terrestrial vegetation contributes substantially to global methane emissions. Although trees may act as a conduit for methane release from soils to atmosphere, the debate centers on whether vegetation directly produces methane by an uncharacterized, abiotic mechanism. A second mechanism of direct methane production in plants occurs when methanogens – microorganisms in the domain Archaea – colonize the wood of living trees. In the debate this biotic mechanism has largely been ignored, yet conditions that promote anaerobic activity in living wood, and hence potentially methane production, are prevalent across forests. We find average, growing season, trunk-gas methane concentrations >15,000 ?L·L?1 in common, temperate-forest species. In upland habitat (where soils are not a significant methane source), concentrations are 2.3-times greater than in lowland areas, and wood cores produce methane in anaerobic, lab-assays. Emission rate estimates from our upland site are 52 ± 9.5 ng CH4 m?2 s?1; rates that are of a similar magnitude to the soil methane sink in temperate forest, and equivalent in global warming potential to ?18% of the carbon likely sequestered by this forest. Microbial infection of one of the largest, biogenic sinks for carbon dioxide, living trees, might result in substantial, biogenic production of methane. Estimating pesticide sampling rates by the polar organic chemical integrative sampler (POCIS) in the presence of natural organic matter and varying hydrodynamic conditions 2012 Charlestra L., Amirbahmanb A., Courtemanchc D.L., Alvarezd D.A., and Pattersone H. 2012. Estimating pesticide sampling rates by the polar organic chemical integrative sampler (POCIS) in the presence of natural organic matter and varying hydrodynamic condi Publications The polar organic chemical integrative sampler (POCIS) was calibrated to monitor pesticides in water under controlled laboratory conditions. The effect of natural organic matter (NOM) on the sampling rates (Rs) was evaluated in microcosms containing 0.05). However, flow velocity and turbulence significantly increased the sampling rates of the pesticides in the FTS and SBE compared to the QBE (p < 0.001). The calibration data generated can be used to derive pesticide concentrations in water from POCIS deployed in stagnant and turbulent environmental systems without correction for NOM. Exploring the links between census and environment using remotely sensed satellite sensor imagery 2013 Watmough G.R., Atkinson P.M., and Hutton C.W. 2013. Exploring the links between census and environment using remotely sensed satellite sensor imagery. Journal of Land Use Science 8(3); 284-303. Publications Relationships are often found between socio-economic variables and environmental factors for relatively small study regions. This research forms an exploratory data analysis using logistic regression to explore the (non-causal) relationships between socio-economic variables from a national census (female literacy and involvement in economic alternatives to agricultural work) and environmental metrics extracted from Earth observation (EO) data. The relationships observed often supported those found in the literature and field observations. The research highlighted the limited but potentially valuable use of EO data for monitoring socio-economic conditions which may be used to target development assistance in the future. Farm management, not soil microbial diversity, controls nutrient loss from smallholder tropical agriculture 2015 Wood S.A., Almaraz M., Bradford M.A., McGuire K.L., Naeem S., Neill C., Palm C.A., Tully K.L., and Zhou J. Publications Tropical smallholder agriculture is undergoing rapid transformation in nutrient cycling pathways as international development efforts strongly promote greater use of mineral fertilizers to increase crop yields. These changes in nutrient availability may alter the composition of microbial communities with consequences for rates of biogeochemical processes that control nutrient losses to the environment. Ecological theory suggests that altered microbial diversity will strongly influence processes performed by relatively few microbial taxa, such as denitrification and hence nitrogen losses as nitrous oxide, a powerful greenhouse gas. Whether this theory helps predict nutrient losses from agriculture depends on the relative effects of microbial community change and increased nutrient availability on ecosystem processes. We find that mineral and organic nutrient addition to smallholder farms in Kenya alters the taxonomic and functional diversity of soil microbes. However, we find that the direct effects of farm management on both denitrification and carbon mineralization are greater than indirect effects through changes in the taxonomic and functional diversity of microbial communities. Changes in functional diversity are strongly coupled to changes in specific functional genes involved in denitrification, suggesting that it is the expression, rather than abundance, of key functional genes that can serve as an indicator of ecosystem process rates. Our results thus suggest that widely used broad summary statistics of microbial diversity based on DNA may be inappropriate for linking microbial communities to ecosystem processes in certain applied settings. Our results also raise doubts about the relative control of microbial composition compared to direct effects of management on nutrient losses in applied settings such as tropical agriculture. Fertilizer type and species composition affect nutrient leachate in coffee agroecosystems 2013 Tully K., Wood S.A., Lawrence D. 2013. Fertilizer type and species composition affect nutrient leachate in coffee agroecosystems. Agroforestry Systems, 87:1083-1100. Publications Intensification of coffee (Coffea arabica) production is associated with increases in inorganic fertilizer application and decreases in species diversity. Both the use of organic fertilizers and the incorporation of trees on farms can, in theory, reduce nutrient loss in comparison with intensified practices. To test this, we measured nutrient concentrations in leachate at 15 and 100 cm depths on working farms. We examined (1) organically managed coffee agroforests (38 kg N ha−1 year−1; n = 4), (2) conventionally managed coffee agroforests (96 kg N ha−1 year−1; n = 4), and (3) one conventionally managed monoculture coffee farm in Costa Rica (300 kg N ha−1 year−1). Concentrations of nitrate (NO3 −-N) and phosphate (PO4 3−-P) were higher in the monoculture compared to agroforests at both depths. Nitrate concentrations were higher in conventional than organic agroforests at 15 cm only. Soil solutions collected under nitrogen (N)-fixing Erythrina poeppigiana had elevated NO3 −-N concentrations at 15 cm compared to Musa acuminata (banana) or Coffea. Total soil N and carbon (C) were also higher under Erythrina. This research shows that both fertilizer type and species affect concentrations of N and P in leachate in coffee agroecosystems. Historical carbon emissions and uptake from the agricultural frontier of the Brazilian Amazon 2011 Galford G.L., Melillo J.M., Kicklighter D.W., Mustard J.F., Cronin T.W., Cerri C.E.P., and Cerri C.C. 2011. Historical carbon emissions and uptake from the agricultural frontier of the Brazilian Amazon. Ecological Applications 21(3), 750–763. Publications Tropical ecosystems play a large and complex role in the global carbon cycle. Clearing of natural ecosystems for agriculture leads to large pulses of CO2 to the atmosphere from terrestrial biomass. Concurrently, the remaining intact ecosystems, especially tropical forests, may be sequestering a large amount of carbon from the atmosphere in response to global environmental changes including climate changes and an increase in atmospheric CO2. Here we use an approach that integrates census-based historical land use reconstructions, remote-sensing-based contemporary land use change analyses, and simulation modeling of terrestrial biogeochemistry to estimate the net carbon balance over the period 1901–2006 for the state of Mato Grosso, Brazil, which is one of the most rapidly changing agricultural frontiers in the world. By the end of this period, we estimate that of the state’s 925 225 km2, 221 092 km2 have been converted to pastures and 89 533 km2 have been converted to croplands, with forest-to-pasture conversions being the dominant land use trajectory but with recent transitions to croplands increasing rapidly in the last decade. These conversions have led to a cumulative release of 4.8 Pg C to the atmosphere, with ;80% from forest clearing and 20% from the clearing of cerrado. Over the same period, we estimate that the residual undisturbed ecosystems accumulated 0.3 Pg C in response to CO2 fertilization. Therefore, the net emissions of carbon from Mato Grosso over this period were 4.5 Pg C. Net carbon emissions from Mato Grosso since 2000 averaged 146 Tg C/yr, on the order of Brazil’s fossil fuel emissions during this period. These emissions were associated with the expansion of croplands to grow soybeans. While alternative management regimes in croplands, including tillage, fertilization, and cropping patterns promote carbon storage in ecosystems, they remain a small portion of the net carbon balance for the region. This detailed accounting of a region’s carbon balance is the type of foundation analysis needed by the new United Nations Collaborative Programmme for Reducing Emissions from Deforestation and Forest Degradation (REDD). How Strong is the Evidence for the Existence of Poverty Traps? A Multicountry Assessment 2013 McKay, A. and Perge E. 2013. How Strong is the Evidence for the Existence of Poverty Traps? A Multicountry Assessment, Journal of Development Studies, 49 (7), 877-897. Publications Introducing this special collection on asset dynamics and poverty traps, this article assesses evidence on these issues across eight panel data sets in six countries generally not previously considered in this perspective. It examines the importance of assets in relation to chronic poverty and uses parametric and non-parametric methods to test for dynamic asset-based poverty traps. The article finds that chronically poor households have lower levels of assets than others, though does not find evidence of the non-convexities which would imply a multiple dynamic poverty trap. From this base the article introduces the remainder of the articles in this collection which set out many promising approaches to further develop and improve methods and approaches for looking at poverty traps in future. Identifying potential synergies and trade-offs for meeting food security and climate change objectives in sub-Saharan Africa 2010 Palm, C., Smukler S., Sullivan C., Mutuo P., Nyadzi G., and Walsh M. 2010. Identifying potential synergies and trade-offs for meeting food security and climate change objectives in sub-Saharan Africa. PNAS 107 (46) 19627-19632. Publications Potential interactions between food production and climate mitigation are explored for two situations in sub-Saharan Africa, where deforestation and land degradation overlap with hunger and poverty. Three agriculture intensification scenarios for supplying nitrogen to increase crop production (mineral fertilizer, herbaceous legume cover crops—green manures—and agroforestry—legume improved tree fallows) are compared to baseline food production, land requirements to meet basic caloric requirements, and greenhouse gas emissions. At low population densities and high land availability, food security and climate mitigation goals are met with all intensification scenarios, resulting in surplus crop area for reforestation. In contrast, for high population density and small farm sizes, attaining food security and reducing greenhouse gas emissions require mineral fertilizers to make land available for reforestation; green manure or improved tree fallows do not provide sufficient increases in yields to permit reforestation. Tree fallows sequester significant carbon on cropland, but green manures result in net carbon dioxide equivalent emissions because of nitrogen additions. Although these results are encouraging, agricultural intensification in sub-Saharan Africa with mineral fertilizers, green manures, or improved tree fallows will remain low without policies that address access, costs, and lack of incentives. Carbon financing for small-holder agriculture could increase the likelihood of success of Reducing Emissions from Deforestation and Forest Degradation in Developing Countries programs and climate change mitigation but also promote food security in the region. Measuring Socio-economic Status in the Millennium Villages: The Role of Asset Index Choice 2013 Michelson H., Muñiz M., DeRosa K. 2013. Measuring Socio-economic Status in the Millennium Villages: The Role of Asset Index Choice. The Journal of Development Studies 49(7) 917-935. Publications How are poverty analyses and poverty traps assessments affected by the choice among conventional methods of asset index construction? To address this question, this article uses panel data from four sites in the Millennium Villages Project (MVP) in Malawi, Tanzania, Mali and Ghana to study the relationship between eight asset indices and the sensitivity of findings related to poverty rates, poverty transitions and poverty traps to the index used. We find that although estimations of poverty rates and transitions are largely consistent across indices, evidence of poverty traps can be conditional on which asset index is used. The asset indices studied include structural income, principal components, factor analysis and a reduced set of assets reflecting the portfolio assessed in the Demographic Health Survey (DHS) data. Metrics for land-scarce agriculture 2015 DeFries R., Fanzo J., Remans R., Palm C., Wood S., and Anderman T.L. Publications Over the past half-century, the paradigm for agricultural development has been to maximize yields through intensifying production, particularly for cereal crops (1). Increasing production of high-yielding cereals—wheat, rice, and maize—has replaced more nutrient-rich cereals, which has eroded the content of essential dietary nutrients in the world's cereal supply. New approaches are needed to produce healthy foods, rich in essential nutrients, with efficient use of land. Standard yield metrics that measure the quantity of production are inadequate to assess progress toward this goal; thus, we propose alternative metrics of nutritional yields. More trees less loss: Nitrogen leaching losses decrease with increasing biomass in coffee agroforests Tully K.L., Lawrence D., and Scanlon, T.M. 2012. More trees less loss: Nitrogen leaching losses decrease with increasing biomass in coffee agroforests. Agriculture, Ecosystems & Environment 161, pp. 137– 144. Publications The mitigation of nutrient leaching losses is an important ecosystem service, and is easily affected by small-scale management decisions. This study was conducted on eight coffee agroforests in Costa Rica, in order to identify particular mechanisms preventing nutrient leaching losses. First, we examined how nitrogen (N) and phosphorus (P) leaching losses differed between coffee agroforests amended with mineral or organic fertilizers. Monthly N and P concentrations were measured in soil water using tension lysimeters (at 15 and 100 cm) between October 2008 and September 2009, and a water balance model was developed to estimate annual nutrient leaching losses from these agroforests. Second, we examined the effects of human interventions (fertilizer type and quantity), biology (shade trees), and chemistry (soil properties) on nutrient leaching losses. Despite differences in the quantity and form of fertilizer inputs, N and P losses at 100 cm did not differ significantly between organically and conventionally managed agroforests (119 kg N ha?1 yr?1 and 1.5 kg P ha?1 yr?1, respectively). Rather, N losses declined linearly with increasing shade tree biomass, which is determined by farmers. Phosphorus losses, on the other hand, declined with increasing soil iron pools, which are independent of management decisions. Multi-sector interventions to accelerate reductions in child stunting: An observational study from 9 sub-Saharan African countries Remans R., Pronyk P.M., Fanzo J.C., Chen J., Palm C.A., Nemser B., Muniz M., Radunsky A., Abay A.H., Coulibaly M., Mensah-Homiah J., Wagah M., An X., Mwaura C., Quintana E., Somers M.A., Sanchez P.A., Sachs S.E., McArthur J.W., and Sachs J.D. 2011. Multi- Publications BACKGROUND: In sub-Saharan Africa, ~ 40% of children 20%. A stratified random sample of households and resident children <2 y old from villages exposed to the program were enrolled in the study. Main outcome measures included principal determinants of undernutrition and childhood stunting, which was defined as a height-for-age z score less than -2. National trends in stunting were generated from demographic and health surveys. RESULTS: Three years after the start of the program in 2005-2006, consistent improvements were observed in household food security and diet diversity, whereas coverage with child care and disease-control interventions improved for most outcomes. The prevalence of stunting in children <2 y old at year 3 of the program (2008-2009) was 43% lower (adjusted OR: 0.57; 95% CI: 0.38, 0.83) than at baseline. The average national stunting prevalence for the countries included in the study had remained largely unchanged over the past 2 decades. CONCLUSION: These findings provide encouraging evidence that a package of multisector interventions has the potential to produce reductions in childhood stunting. Nitrous oxide (N2O) emissions in response to increasing fertilizer addition in maize (Zea mays L.) agriculture in western Kenya 2014 Hickman JE, CA Palm, P Mutuo, JM Melillo, and J Tang. Nitrous oxide (N2O) emissions in response to increasing fertilizer addition in maize (Zea mays L.) agriculture in western Kenya. Nutrient Cycling in Agroecosystems. DOI 10.1007/s10705-014-9636-7. Publications National and regional efforts are underway to increase fertilizer use in sub-Saharan Africa, where attaining food security is a perennial challenge and mean fertilizer use in many countries is <10 % of nationally recommended rates. Increases in nitrogen (N) inputs will likely cause increased emissions of the greenhouse gas nitrous oxide (N2O). We established experimental plots with different rates of N applied to maize (Zea mays) in a field with a history of nutrient additions in western Kenya and measured N2O fluxes. Fertilizer was applied by hand at 0, 50, 75, 100, and 200 kg N ha−1 in a split application on March 22 and April 20, 2010. Gas sampling was conducted daily during the week following applications, and was otherwise collected weekly or biweekly until June 29, 2010. Cumulative fluxes were highest from the 200 kg N ha−1 treatment, with emissions of 810 g N2O–N ha−1; fluxes from other treatments ranged from 620 to 710 g N2O–N ha−1, but with no significant differences among treatments. Emissions of N2O during the 99-day measurement period represented <0.1 % of added fertilizer N for all treatments. Though limited to a single year, these results provide further evidence that African agricultural systems may have N2O emission factors substantially lower than the global mean. One size does not fit all: Conservation farming success in Africa more dependent on management than on location 2013 Gatere L., Lehmann J., DeGloria S., Hobbs P., Delve R., Travis A. 2013. One size does not fit all: Conservation farming success in Africa more dependent on management than on location. Agriculture, Ecosystems & Environment. Volume 179 p. 200-207. Publications Conservation agriculture practices have been successfully applied to improve crop yields in South America, but questions arose whether these practices can be successfully implemented in Africa. Here we show that a specific set of soil conservation practices called conservation farming (CF) using planting basins and hand hoes disseminated on 280 farms in Zambia on average failed to increase maize yields compared to traditional farming (TF). Average grain yield was low with 1.2 t ha−1, but variation between farms was large with a variance of 32% for CF, ranging in individual farms from 0.02 to 2.8 t ha−1. Yields on farms that declared to practice CF were more constrained by inappropriate management (P < 0.001 of multiple stepwise regression; 13% of total variability) such as lack of early planting and insufficient weeding (25% of total variability explained by management) than by site or climatic conditions. In contrast, yields under TF varied the most (26%) based on the amount and types of inputs. CF practices increased maize yields at rainfall below 1000 mm yr−1, and in valley bottoms possibly due to the water-collecting properties of the planting basins, but decreased yields in lower slope and valley positions of higher rainfall regions above 1000 mm yr−1 likely due to waterlogging. Observed management constraints in comparison to site or soil conditions highlight the critical importance of training needed to make complex interventions such as CF successful in areas where means and infrastructure are insufficient to provide farmers with external inputs. Organically managed coffee agroforests have larger soil phosphorus but smaller soil nitrogen pools than conventionally managed agroforests 2013 Tully K., Lawrence D., Wood S.A. 2013. Organically managed coffee agroforests have larger soil phosphorus but smaller soil nitrogen pools than conventionally managed agroforests. Biogeochemistry, 115:385-397. Publications The cultivation of crops in the presence of trees (agroforestry) and organic agriculture are management strategies thought to reduce nutrient losses to the environment and increase soil organic matter. Little is known, however, about the differences between organic and conventionally managed agroforests. This research examines how soil nutrient pools and mechanisms for nutrient retention may vary between these two different types of coffee agroforests. We determined variation in soil nutrient pools and nutrient retention capacity among (1) coffee farms in Costa Rica receiving mineral (conventional management) and organic inputs (organic management) and (2) different combinations of shade tree species. Soil nutrient pools and retention capacity were altered by fertilizer management. Soil nitrogen (N) and carbon (C) pools were significantly larger in conventional agroforests, but C:N ratios were similar among agroforests. Soil phosphorus (P) pools were significantly higher in organic agroforests. Overall, C and N concentrations were strongly positively correlated with oxalate-extractable aluminum concentrations. We did not observe many strong species effects; however, soil cation exchange capacity was higher under Coffea–Musa combinations than under Coffea and N-fixing Erythrina combinations. Thus, mechanisms are in place to promote nutrient retention in agroforestry systems, but these mechanisms can be altered by management practices with consequences for long-term nutrient storage. Predicting socioeconomic census variables from satellite sensor data in rural developing countries: a case study using female literacy in Assam, India 2013 Watmough G.R., Atkinson P.M., Hutton C.W. 2013. Predicting socioeconomic census variables from satellite sensor data in rural developing countries: a case study using female literacy in Assam, India. Applied Geography, 44; 192-200. Publications Social data from census and household surveys provide key information for monitoring the status of populations, but the data utility can be limited by temporal gaps between surveys. Recent studies have pointed to the potential for remotely sensed satellite sensor data to be used as proxies for social data. Such an approach could provide valuable information for the monitoring of populations between enumeration periods. Field observations in Assam, north-east India suggested that socioeconomic conditions could be related to patterns in the type and abundance of local land cover dynamics prompting the development of a more formal approach. This research tested if environmental data derived from remotely sensed satellite sensor data could be used to predict a socioeconomic outcome using a generalised autoregressive error (GARerr) model. The proportion of female literacy from the 2001 Indian National Census was used as an indicator of socioeconomic conditions. A significant positive correlation was found with woodland and a significant negative correlation with winter cropland (i.e., additional cropping beyond the normal cropping season). The dependence of female literacy on distance to nearest road was very small. The GARerr model reduced residual spatial autocorrelation and revealed that the logistic regression model over-estimated the significance of the explanatory covariates. The results are promising, while also revealing the complexities of population–environment interactions in rural, developing world contexts. Further research should explore the prediction of socioeconomic conditions using fine spatial resolution satellite sensor data and methods that can account for such complexities. Small farmers and big retail: Trade-offs of supplying supermarkets in Nicaragua Michelson H., Reardon T., and Perez F. 2012. Small farmers and big retail: Trade-offs of supplying supermarkets in Nicaragua. World Development 40(2), 342–354. Publications In Nicaragua and elsewhere in Central America, small-scale farmers are weighing the risks of entering into contracts with supermarket chains. We use unique data from cooperatives supplying supermarkets to study the effect of supply agreements on producers’ mean output prices and price stability. We find that prices paid by the domestic retail chain approximate the traditional market in mean and variance while mean prices paid by Walmart are significantly lower than the traditional market. However, the Walmart contract is found to systematically reduce price volatility. We find some evidence, however, that farmers may be paying too much for this contractual insurance against price variation. Smallholder farmer cropping decisions related to climate variability across multiple regions 2014 Wood, S.A., Jina, A.S., Jain, M., Kristjanson, P., & DeFries, R.S. Publications A long history of household-level research has provided important local-level insights into climate adaptation strategies in the agricultural sector. It remains unclear to what extent these strategies are generalizable or vary across regions. In this study we ask about three potential key factors influencing farming households’ ability to adapt: access to weather information, household and agricultural production-related assets, and participation in local social institutions. We use a 12-country data set from sub-Saharan Africa and South Asia to explore the links between these three potential drivers of agricultural change and the likelihood that farmers made farm-associated changes, such as adopting improved crop varieties, increasing fertilizer use, investing in improved land management practices, and changing the timing of agricultural activities. We find evidence that access to weather information, assets, and participation in social institutions are associated with households that have reported making farming changes in recent years, although these results vary across countries and types of practices. Understanding these drivers and outcomes of farm-associated changes across different socio-economic and environmental conditions is critical for ongoing dialogues for climate-resilient strategies and policies for increasing the adaptive capacity of smallholders under climate change. Smallholder participation in contract farming: Comparative evidence from five countries 2012-04 Barrett C.B., Bachke M.E., Bellemare M.F., Michelson H.C., Narayanan S., and Walker T.F. 2012. Smallholder participation in contract farming: Comparative evidence from five countries. World Development 40 (4), 715–730. Publications Supermarkets, specialized wholesalers, processors, and agro-exporters are transforming the marketing channels into which smallholder farmers sell produce in low-income economies. We develop a conceptual framework with which to study contracting between smallholders and a commodity-processing firm. We then synthesize results from empirical studies of contract farming arrangements in five countries (Ghana, India, Madagascar, Mozambique, and Nicaragua). The resulting meta-narrative documents patterns of participation, the welfare gains associated with participation, reasons for nonparticipation, the significant extent of contract noncompliance, and the considerable dynamism of these value chains as farmers and firms enter and exit frequently. SoilGrids1km — Global Soil Information Based on Automated Mapping 2014 Hengl, T., Mendes de Jesus, J., MacMillan, R.A., Batjes, N.H., Heuvelink, G.B.M., Ribeiro, E., Samuel-Rosa, A., Kempen B, JCB Leenaars, M Walsh, and MR Gonzalez. 2014. SoilGrids1km — Global Soil Information Based on Automated Mapping. PLOS, 9, 8, e105992. Publications We present SoilGrids1km — a global 3D soil information system at 1 km resolution — containing spatial predictions for a selection of soil properties (at six standard depths): soil organic carbon (g kg−1), soil pH, sand, silt and clay fractions (%), bulk density (kg m−3), cation-exchange capacity (cmol+/kg), coarse fragments (%), soil organic carbon stock (t ha−1), depth to bedrock (cm), World Reference Base soil groups, and USDA Soil Taxonomy suborders. Our predictions are based on global spatial prediction models which we fitted, per soil variable, using a compilation of major international soil profile databases (ca. 110,000 soil profiles), and a selection of ca. 75 global environmental covariates representing soil forming factors. Results of regression modeling indicate that the most useful covariates for modeling soils at the global scale are climatic and biomass indices (based on MODIS images), lithology, and taxonomic mapping units derived from conventional soil survey (Harmonized World Soil Database). Prediction accuracies assessed using 5–fold cross-validation were between 23–51%. Soils: A contemporary perspective Palm C., Sanchez P., Ahamed S., and Awiti A. 2007. Soils: A contemporary perspective. Annual Review of Environment and Resources 32: 99-129. Publications Soils are viewed in the context of ecosystem services, soil processes and properties, and key attributes and constraints. The framework used is based on the premise that the natural capital of soils that underlies ecosystem services is primarily determined by three core soil properties: texture, mineralogy, and soil organic matter. Up-to-date descriptions and geographical distribution of soil orders as well as soil attributes and constraints are given, along with the relationships between soil orders, properties, and biomes. We then relate ecosystem services to specific soil processes, soil properties, and soil constraints and attributes. Soil degradation at present is not adequately assessed and quantified. The use of an approach combining digital soil maps, pedotransfer functions, remote sensing, spectral analysis, and soil inference systems is suggested for simultaneous characterization of various chemical, physical, and biological properties to overcome the great limitations and costs of conventional methods of soil assessments. 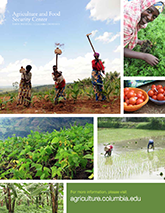 The African Green Revolution: Results from the Millennium Villages Project Nziguheba G., Palm C.A., Berhe T., Denning G., Dicko A., Diouf O, Diru W., Flor R., Frimpong F., Harawa R., Kaya B., Manumbu E., McArthur J., Mutuo P., Ndiaye M., Niang A., Nkhoma P., Nyadzi G., Sachs J., Sullivan C., Teklu G., Tobe L., and Sanchez P.A. 2 Publications The Millennium Villages Project (MVP) was initiated in 2005 to implement the recommendations of the UN Millennium Project for achieving the Millennium Development Goals (MDGs). The project is carried out in 14 sites in hunger and poverty hotspots in diverse agroecological zones in sub-Saharan Africa (SSA). The interventions and results for increasing staple crop yields are presented for eight MV sites and cover 52,000 farming households or 310,000 people. By supporting farmers with fertilizers, improved crop germplasm, and intensive training on appropriate agronomic practices, average yields of 3 t ha1 were exceeded in all sites where maize is the major crop. Teff yields doubled in the Ethiopian site. In contrast, there was little improvement in millet and groundnut yields in the semiarid and arid sites in West Africa. Over 75% of the farms had maize yields of 3 t ha1 and less than 10% of the households had yields lower than 2 t ha1. Households produced enough maize to meet basic caloric requirements, with the exception of farms smaller than 0.2 ha in Sauri, Kenya. Value-to-cost ratios of 2 and above show that the investment in seed and fertilizer is profitable, provided surplus harvests were stored and sold at peakprices. Increased crop yields are the first step in the African Green Revolution, and must be followed by crop diversification for improving nutrition and generating income and a transition to market-based agriculture. A multisector approach that exploits the synergies among improved crop production, nutrition, health, and education is essential to achieving the MDGs. The African Millennium Villages 2007 Sanchez P., Palm C., Sachs J., Denning G., Flor R., Harawa R., Jama B., Kiflemariam T., Konecky B., Kozar R., Lelerai E., Malik A., Modi V., Mutuo P., Niang A., Okoth H., Place F., Sachs S.E., Said A., Siriri D., Teklehaimanot A., Wang K., Wangila J., and Publications We describe the concept, strategy, and initial results of the Millennium Villages Project and implications regarding sustainability and scalability. Our underlying hypothesis is that the interacting crises of agriculture, health, and infrastructure in rural Africa can be overcome through targeted public-sector investments to raise rural productivity and, thereby, to increased private-sector saving and investments. This is carried out by empowering impoverished communities with science-based interventions. Seventy-eight Millennium Villages have been initiated in 12 sites in 10 African countries, each representing a major agroecological zone. In early results, the research villages in Kenya, Ethiopia, and Malawi have reduced malaria prevalence, met caloric requirements, generated crop surpluses, enabled school feeding programs, and provided cash earnings for farm families. The effect of mineral and organic nutrient input on yields and nitrogen balances in western Kenya 2015 Tully K.L., Wood S.A., Almaraz M., Neill C., Palm C.A. Publications Soil fertility declines constrain crop productivity on smallholder farms in sub-Saharan Africa. Government and non-government organizations promote the use of mineral fertilizer and improved seed varieties to redress nutrient depletion and increase crop yields. Similarly, rotational cropping with nitrogen (N)-fixing legume cover crops or trees is promoted to improve soil fertility and crop yields. We examined maize grain yields and partial N balances on 24 smallholder maize farms in western Kenya, where interventions have increased access to agricultural inputs and rotational legume technologies. On these farms, mineral fertilizer inputs ranged from 0 to 161 kg N ha−1 (mean = 48 kg N ha−1), and maize grain yields ranged from 1 to 7 t ha−1 (mean = 3.4 t ha−1). Partial N balances ranged from large losses (−112 kg N ha−1) to large gains (93 kg N ha−1) with a mean of −3 kg N ha−1. Maize grain yields increased significantly with N inputs (from fertilizer and legumes) in 2012 but not in 2013 when rainfall was lower. Nitrogen inputs of 40 kg N ha−1 were required to produce 3 t of maize per hectare. N balances varied both among farms and between years, highlighting the importance of tracking inputs and outputs on multiple farms over multiple years before drawing conclusions about nutrient management, soil fertility outcomes and food security. The addition of N from legume rotations was a strong predictor of grain yields and positive N balances in lower-yielding farms in both years. This suggested that legume rotations may be particularly important for buffering yields from climate variability and maintaining N balances in low rainfall years. The impact of climate change on agricultural net revenue: A case study in the Fouta Djallon, West Africa 2014 Wood SA and RO Mendelsohn. 2014. The impact of climate change on agricultural net revenue: A case study in the Fouta Djallon, West Africa. Environment and Development Economics Publications Continental-scale economic analysis suggests that changes in climate conditions are associated with lower agricultural net revenue in sub-Saharan Africa. Specific locations, however, may not reflect this overall trend due to variation in baseline climate, soils, and socioeconomic factors that are difficult to model at large scales. The economic effect of changes in climate conditions on agricultural revenue in particular places in sub-Saharan Africa remains largely unknown. To test this effect, we study an area of West Africa with high climate variation over a small geographic area. We find that higher temperatures and precipitation lower agricultural revenues in the more important rainy season but increase revenues in the less important cool, dry season. The state of soil degradation in Sub-Saharan Africa: Baselines, trajectories, and solutions 2015 Tully K., Sullivan C., Weil R., Sanchez P. Publications The primary cause of soil degradation in sub-Saharan Africa (SSA) is expansion and intensification of agriculture in efforts to feed its growing population. Effective solutions will support resilient systems, and must cut across agricultural, environmental, and socioeconomic objectives. While many studies compare and contrast the effects of different management practices on soil properties, soil degradation can only be evaluated within a specific temporal and spatial context using multiple indicators. The extent and rate of soil degradation in SSA is still under debate as there are no reliable data, just gross estimates. Nevertheless, certain soils are losing their ability to provide food and essential ecosystem services, and we know that soil fertility depletion is the primary cause. We synthesize data from studies that examined degradation in SSA at broad spatial and temporal scales and quantified multiple soil degradation indicators, and we found clear indications of degradation across multiple indicators. However, different indicators have different trajectories—pH and cation exchange capacity tend to decline linearly, and soil organic carbon and yields non-linearly. Future research should focus on how soil degradation in SSA leads to changes in ecosystem services, and how to manage these soils now and in the future. Tools for enhancing interdisciplinary communication Winowiecki L., Smukler S., Shirley K., Remans R., Peltier G., Lothes E., King E., Comita L., Baptista S., and Alkema L. 2011. Tools for enhancing interdisciplinary communication. Sustainability: Science, Practice, and Policy. Publications This is a collaborative community essay, written by ten postdoctoral research fellows who had the opportunity to come together at Columbia University’s interdisciplinary Earth Institute. In many ways, we were different: our disciplinary backgrounds run the gamut in physical and social sciences; we study in different parts of the world, from sub-Saharan Africa to Latin America; we approach our work differently—some of us spend our days in the field collecting and analyzing soil samples, others conduct in-depth interviews in rural communities, while still others spend time in the lab elaborating formulas and crunching numbers. Yet, we found common ground: all of us are committed to addressing issues of sustainability in complex environments. As such, we wanted to harness our diversity and various strengths to bring together scientific, political, economic, demographic, geographic, ecological, and ethical perspectives on the challenges and opportunities of sustainable development. We remain ambitious in our aims. Nonetheless, we realized that our first task was figuring out how to communicate effectively across often disparate disciplines. This community essay chronicles that part of our journey. We hope it will be of use to others who endeavor to work across and beyond traditional academic disciplines. Transmission of World Coffee Prices to Ugandan Coffee Growers in a Liberalized Economy 2013 Musumba M. and Sen Gupta R. 2013. “Transmission of World Coffee Prices to Ugandan Coffee Growers in a Liberalized Economy.” Development Policy Review 31(2), 219-234. Publications This article examines the transmission of world coffee prices to the price received by Ugandan coffee growers by means of Directed Acyclic Graphs which reveal the flow of information from the spot indicator price to the London futures price and then to the growers' price. A positive shock in the futures and indicator prices has respectively a positive and negative effect on the growers' price, and Forecast Error Variance Decomposition shows that uncertainty is attributable to own price, London futures price, and indicator price, in rank order. The article recommends that the Ugandan Coffee Development Authority should provide information on both futures and indicator prices to the growers.